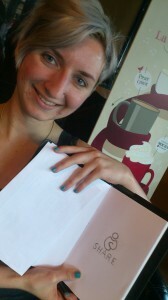 This past Sunday, I met up with Natasha at the Waves on Main and Broadway, seeking her creative help. I showed her some sketches I had made during a sleepless night back in April of 2013. To my pleasant surprise, she really liked the final idea that I had come up with, and took the liberty to sketch it out and refine it. Our logo at first glance is a person hugging themself, and stands for having self compassion, which is integral self care and life. The embrace of the two arms, form an S in the center, again emphasizes the importance of the “self” in an individual’s journey of recovery, reflection and care. The act of a self hug, visually and literally counteract and take the place of self harm, with the word “hug” replacing “harm”. If you turn the logo upside down, you can also see that it forms an image of a fist, which symbolizes the incredible strength that everyone has inside them, which often is not acknowledged by either themselves or others, hence why an extra step needs to be taken to see the fist. After agreeing on how awesome the logo is, we looked over the preliminary meeting guidelines that I had brainstormed. We were pretty much on the same page with all of them. The only one that we were not too sure about was the one with regards to graphic details of self-harm. After a lot of thinking and discussion, we wanted to make sure that there should be a happy medium between maintaining a safe and comfortable environment for all and also allowing the space for people to talk about things and ask questions that they otherwise wouldn’t. Natasha said that we shouldn’t be tiptoeing around the topic anymore, and restricting attendees’ ability to share graphic details would go against with what SHARE is trying to achieve. However, we still need to be aware of the group as a whole, and know that people may be in various headspaces in meeting, and certain descriptions may trigger them and create an unsafe environment. In the end, we decided on the guidelines below, however, since our type of meetings are almost unprecedented in North America, we have to be willing to learn as we go, through trial and error.